It is also recommended to blog at least once a week – if not every day. Ah. I was actually thinking of missing this month but after reading that I have dragged myself to the computer in the dark with my camomile while the baby sleeps. But I’m afraid I have to cram the three topics together – as I did before. And try harder next time. As a newcomer to babies as well, I had no idea how difficult it was to travel with a slightly bigger baby. I managed with Leo at four and a half months without too much difficulty (despite the sterilizing and bottle making morning ritual and the three hours a day spent feeding), but eight and a half months is a completely different story. Things needed include wet wipes, high chair, travel cot, toys, 6 dummies and dummy chain, food (frozen and pouch), bottled water, magic plastic spoons that change colour, wet wipes, backpack carrier, frontpack carrier, buggy, clothes, nappies, bottles and did I mention wet wipes? The list goes on and on. Eight hours later and we (‘we’ being myself, Leo, and my friend, Paul) are all crammed into the Toyota pick-up. Another eight hours (plus a few screaming fits) and we finally make it to Jerez de la Frontera (pronounced ‘Herez’ and nothing like Sherry so how one came to be the other – even for us mono-lingual Brits – is a mystery). We stay in an apartment at the edge of the historical city which has parking – very important for loading and unloading. Another eight hours later we are enjoying a glass of wine on the roof terrace overlooking smoking factories and general city industrial outskirts. 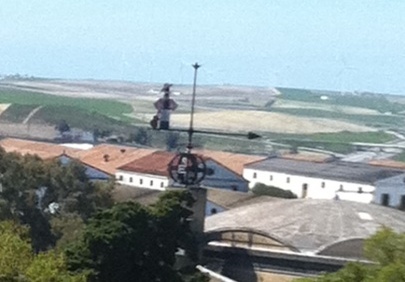 If I look to the right I can just about see the famous icon of Tio Pepe and his guitar looking a little worse for wear. But the three months of rain has finally stopped and Spain heaves a sigh of relief as it prostrates itself to the blue sky. Leo crawls on the plastic grass and beelines for my wine glass, fingers worryingly outstretched. Later I make myself a camomile tea (Manzanilla in Spanish) and he screws up his face when I offer him some. I am quite alarmed at babies’ attraction to wine (assuming Leo isn’t alone?). So I wasn’t sure that a visit to the Bodega to sample the fortified version was a good idea. But there are three things to do in Jerez. Go to see the dancing horses. Go to see flamenco. And go and drink sherry. There are other attractions such as churches and a cathedral, the Alcazar (worth a visit) and a motor track. We give the flamenco a miss as the shows are on late and appear touristy. We do see the horses and they do, indeed, dance – some of them without touching the floor. The Royal Andalucian School of Equestrian Art is a big affair held three or four times a week at midday in a grand indoor school with a bursting gallery. The horses are like ballerinas as they point and pirouette, bow and leap in time to the music. They don’t quite do pliés but I wouldn’t have been surprised if they had. Then to the Bodega. ‘SHERRY IS ONLY PRODUCED IN THIS PART OF ANDALUCIA AND THIS, MY FRIENDS, IS THE BIGGEST AND BEST SHERRY PRODUCING BODEGA IN THE WORLD…’ the little but loud trilingual guide tells us in English, Spanish and German. Incredibly, Leo sleeps through this and on the tourist train that takes us around the grounds but wakes up as soon as he smells the barrels of sherry. He doesn’t appear interested in the explanations of the many different types of sherry (‘DO WE UNDERSTAND NOW THE DIFFERENCE BETWEEN FINO, MANZA… AND OLOROSO OR DO I EXPLAIN AGAIN? ), or the way they are made (‘SO IT ALL DEPENDS ON THE TIME. SPENT. IN. THE. BARREL. AND THE PROCESS OF OXIDATION…’) and he positively screams through the film so I take him to the toilet to change him and he bangs his head on the floor (there are no changing facilities in Spain, or soap or toilet paper in any restaurant or public toilet that I have ever visited) which makes him scream louder. But he becomes quiet for the tasting and, fingers outstretched, tries to grab my glass. After all this I’m feeling the need for a cup of tea so on the way home we stop at one of the many bars decorated with photos of bull fights, flamenco dancers and singers. I am only a little surprised that when I ask for a Manzanilla (meaning camomile tea) I receive a glass of sherry. Leo … well, you can probably guess. Anyway, it is getting late and the sherry is nearly all gone.